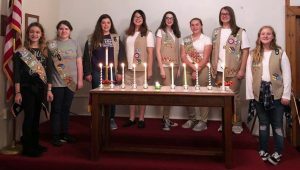 Pleasant Hill Girl Scout Cadette troop #5787 in Sherrard earned its Silver Award on November 5, 2018. This is the second highest award for a Girl Scout to earn. Each girl had to complete 50 hours on the project. The group’s project was about positive thinking. They researched the effects of positive thinking. They created posters with positive thoughts and hung them in the bathrooms and teachers’ lounge at Sherrard Middle School. They also created middle school survival kits for each student at Sherrard Middle School. The kits included positive thoughts with candy and trinkets to wish the students a good upcoming school year. 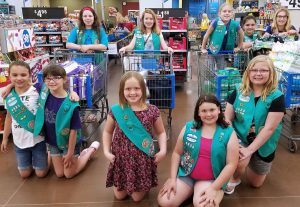 Pictured from left are Cadette troop #5787 members: Shaye Nolan, Holly Freidhof, Shaye Mead, Ayla Duffield, Cora Spielvogel, Paige Messner, Megan Huff and Allyson Fitzpatrick. Junior troop # 4923 earned its Bronze Award in June. This is the third highest award for Girl Scouts to earn. Each girl had to do 20 hours on the project. These girls were in 4th and 5th grade at Hilltop Elementary last school year for this project. For their project, the girls put together goodnight bags for children who are removed from their homes and placed into the foster care system. With the help from a mother who was able to write a grant to fund our project, the group was able to donate 40 bags (20 baby/child, 20 teen) to CASA (Court Appointed Special Advocate) a non-profit organization in the Ohio Valley that is dedicated to the best interest of children in abusive or neglectful situations. The bags included toiletry items, personal care items, diapers, sippy cups and more. Delivery of the bags occurred on June 14 and a formal ceremony was held for the girls on June 24. Pictured from left are Junior troop #4923 members, back row: Mylie Scott, Kameryn Wells, Ella Kulabonish, Allison Hilt and Tori Finley. From left back row: Joelle Gonchoff, Jayce Harvey, Ava Baker-Strawderman, Morgan Messner and Elyse Hicks.